Ari Fuld, murdered in terrorist stabbing 3 months ago, makes posthumous appearance in video from first sovereignty movement conference. 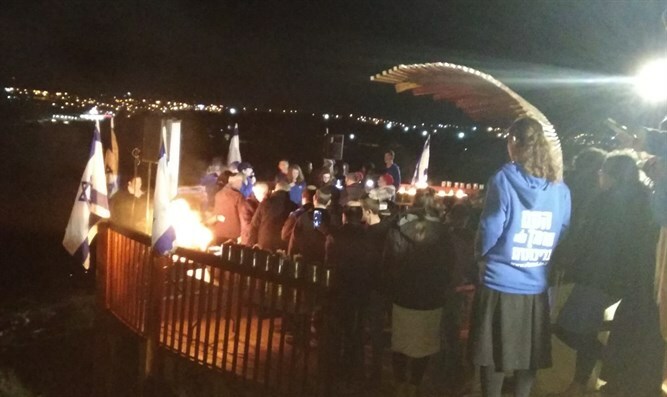 A moving video was revealed Sunday during the lighting ceremony of the eighth candle of Hanukkah at the lookout which was established by activists of the Women in Green movement in memory of Ari Fuld, who was murdered in Gush Etzion about three months ago. In the video, Fuld appears to be in reporting live from the first conference of the Sovereignty Youth Movement, a conference that took place at Heichal Shlomo in Jerusalem and was attended by more than 1,200 youth from all over the country. Fuld broadcast the video to his many followers from all over the world on the social network and expressed his admiration for the clear tone of the youth who came to the conference and expressed the simple principle that there is no more moral and just than Israeli sovereignty over its own country. The film was presented at the lighting ceremony of the last night of Hanukka. The event was attended by members of the Fuld family, Deputy Minister Michael Oren, supporters of Jewish communities in Judea and Samaria, and youth who signed up for a day of activities and enrichment on leadership and media. The entire event at the lookout, which was named after Ari at the top of the hill in the Oz Ve'Gaon reserve, overlooks the Gush Etzion communities and mountains. Immediately thereafter, the activists of the sovereign movement began the 48-hour fundraising campaign to expand and deepen the activities of the youth of sovereignty in the near future. The leaders of the sovereignty movement, Yehudit Katzover and Nadia Matar, said that Ari Fuld, who was one of the movement's most prominent activists, was excited participate in the events and to encourage close relatives to take part in Jewish life in Judea and Samaria. "We will turn mourning into another floor in the Zionist vision, the level of sovereignty on the birthplace of the Jewish people, Judea and Samaria," Katzover and Metar said.